From the beginning of 2011, Bashar al-Assad intended to rule out the possibility that the revolutions of change — first initiated in Tunisia, then Egypt, then spreading to other Arab countries — would come to Syria. al- Assad based his calculations on a number of factors, including his survival of the tribulations marking his recent years in power, some of which nearly ended his reign. Most notable among these were the American occupation and its aftermath in Iraq, as well as the evacuation of the Syrian army from Lebanon after the assassination of the former Lebanese Prime Minister Rafic Hariri. But the prevailing winds did not favor the regime. Scattered demonstrations broke out in a number of Syrian cities on 15 March 2011, and a group of children were arrested in Daraa on charges of writing slogans against the regime on the walls of their school. They were tortured and the local authorities refused to release them or respond to the demands of their parents. Thus demonstrations took place in Daraa on 18 March 20111, first calling for reform of the regime, then for its fall after the demonstrations were met with severe repression. Demonstrations spread to other cities and towns across Syria, encompassing wide swaths of the country within months. balances of power shifted and different actors became involved. 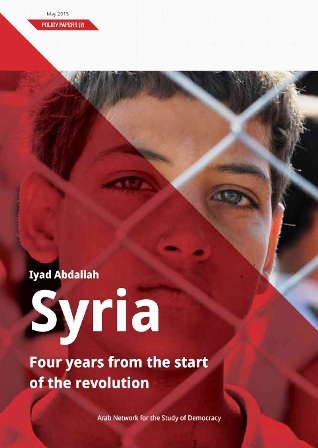 This publication is a research paper in a series of policy papers published by the Arab Network for the Study of Democracy, which seek to document and analyze the political developments in the countries of the Arab Middle East that have witnessed popular uprisings, assessing both their initial causes and the resultant changes and conflicts, four years later. Iyad Abdallah is a Syrian author, graduate of the University of Aleppo (Department of Philosophy), and member of the editorial board of al-Jumhuriya (previously known as the Republic for the Study of the Syrian Revolution). He has published articles in several pan-Arab periodicals, and has participated in a number of studies regarding the situation in Syria. He currently resides in Paris. Translated from Arabic by Jeffrey D. Reger.